Ron Zacapa is a product by Rum Creation & Company Inc, a company of Industrias Licoreras de Guatemala whose Master Blender is Ana Lorena Vásquez Ampie. Her job consists not only of the blending but she is in fact responsible for the whole process all the way from distilling till bottling. The distillation is only done once a year during a short period (2 months) directly after the harvest of the sugar cane during which Lorena is very busy in controlling the quality of the product. Ron Zacapa Centenario represents the culmination of several generations dedicated to the manufacture of genuine aged rums. The history of Zacapa rum starts with the erection of a new city in 1876: Zacapa(one of the departments of Guatemala). Nothing out of the ordinary happened until the year 1914, when Industria Licorera Guatemalteca started to produce rum. Between 1914 and 1939 several Guatemalan families individually established their own spirits companies throughout the country. In 1930 Company Industria Licorera Euzkadi opened its doors and in that same year Licorera Zacapaneca also started rum production. Finally in 1939 Industria Licorera Quezalteca opened its doors and in 1944 these four companies begun the merging of the companies. By doing so they were able to create a more modern distillery, which was needed in those fast developing modern times when the liquor industry was a growing factor in Guatemala’s economy. The new group of many companies was named Industrias Licoreras de Guatemala. As time went by new insights grew and a new company called La Nacional, Distribuidora de Licores S.A. was created in 1959 which was dedicated for marketing, distribution and sales as a combined project. Today La Nacional even includes an in-house printing company, regional distribution centres and product transportation services. It took them until 1976 to establish the brand Ron Zacapa. This name was given as a celebration during a festival commemorating the 100th anniversary of the founding of the town of Zacapa. Ron Zacapa sources its sugar cane from the plantations of Retalhuleu and Suchitepéquez. Now Ron Zacapa encompasses only serious rums intended for sipping. Zacapa uses their own distillery and four different production plants and they invest steadily in the incorporation of technology and have direct operations in the countries of the Central American region. At the moment Ron Zacapa is created in one of the most modern distilleries where nothing is thrown away but all reused. With already several serious prices in the pocket, there came another price to Zacapa: Diageo. On Thursday the 7th of February 2008 Diageo announced that it had been granted a three year distribution and joint marketing agreement by Industrias Licoreras de Guatemala, a group of companies for the Zacapa rum brand through its company Rum Creation & Products, Inc. The agreement will run from 1st of April 2008 and will give Diageo global distribution rights although all of the countries in Central America including Guatemala duty free shop will be excluded. At the end of the three year agreement Diageo will have an option to buy a 50% equity stake in the brand subject to performance criterion. No financial details were disclosed. Diageo is the world's leading premium drinks business. With its global vision, and local marketing focus, Diageo brings to consumers a wide collection of beverage alcohol brands across the spirits, wine and beer categories including Johnnie Walker, Buchannan’s and Captain Morgan rum. Diageo trades in some 180 countries around the world and is listed on both the New York Stock Exchange (DEO) and the London Stock Exchange (DGE). ”Some of the most iconic drinks brands in the world are produced in Latin America & the Caribbean, from Don Julio tequila to Red Stripe lager, and we are delighted to be given the opportunity to distribute and market Zacapa, one of the most acclaimed rums in the world. Rum begins its life with the processing of sugar cane and all the cane that Zacapa needs comes from their own grounds in the south coast of Guatemala, from the fields located in Retalhuleu. This is important, because this way they can better control the quality. The sugar cane fields are grown in the valleys on rich volcanic soil at 300 and 350 meters above sea level where the average temperature ranges between 24° and 30° C.
The soil has a strong acidity which is good for sugar cane growth. In addition there are also grounds that are called Vertisol, which is very rich soil with clay in it. The strong clay gives pressure to the sugar cane roots and thus the plant grows stronger and better. 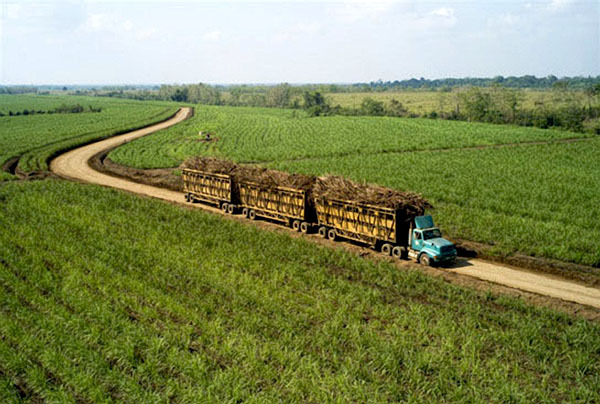 The sugar cane is better transported to the part of the plant above the ground. These rich and fertile soils are irrigated by the numerous rivers that cross this area and the warm climate and the humidity of the region are perfect for the development of the sugar cane, which largely depends on the availability of sunlight and the acidity of the volcanic soil. In fact, Guatemala is the fifth largest exporter of sugar in the world. Sugar Cane grows in the shape of a thin, long reed, very similar to bamboo and has a 5 year cycle. It takes between 12 and 14 months for the sugar cane to ripen. At Zacapa they only harvest during the second year of the plant, because after one year the sugar cane is not yet ready. Just before harvesting the fields are burned which eliminates the leaves. As they are burned a nice and sweet smell of burnt sugar cane spreads all over the fields. Harvesting of the sugar cane is done mechanically or by hand during a time known as “Zafra”, which means harvest. The cane is cut and transported to the mill to begin the process of extracting the sugar cane juice. First the cane is weighed and analyzed to determine its quality based on the content of sucrose, fibre and levels of impurity. Then, it is taken to be washed, where the water removes any impurities and prevents them from entering the production stage. The clean cane is then chopped and pressed by a noisy machine, allowing all the juice to be extracted. The juice obtained from the milling is subjected to heating, clarification and filtration; these processes separate the juice from the fibrous solids, also known as “bagasse”. The bagasse that is left over from the crushing of the cane is used in the boiler as an energy source to power the whole production process. The juice is them heated to evaporate water and the resulting sticky-liquid base ‘virgin sugar cane honey’ (VSCH) or Sugar Cane Syrup is obtained, which is then ready for distillation. This syrup is the fresh juice of the cane with most of the water removed, but all sugars are still in it. The colour is somewhat like a medium dark honey with a (also) honey-like viscosity. This allows Zacapa to make rum from the full sugar content of the cane juice year 'round though they only distil 2 months a year. Most rum distillers use Blackstrap Molasses, a residue from the sugar refining process. Blackstrap Molasses has a bitter taste and the fresh spirit made from this can be very sharp with a bite. The Vesou types from French overseas Territories are more herbal and flowery. In comparison VSCH gives more sweetness to the rum. Roughly about 5 percent of the world's rum producers use freshly pressed cane juice or VSCH. Zacapa’s Master Blender Lorena Vasquez (one of three female master blenders in the rum world at this moment) insists using VSCH is a key to making rum that's both luscious and elegant. The virgin sugar cane honey is stored in large tanks, where it waits for the production to begin. It is diluted until the adequate sugar concentration is obtained in order to begin the fermentation process. Zacapa adds a yeast strain called Saccharomyces cerevisae which is extracted from pineapples. The yeast will transform as much sugar as possible into alcohol, carbon dioxide and other chemical compounds such as aldehydes, esters, higher alcohols and a few acids. The yeast of the pineapple is very good in doing this trick. The aforementioned are responsible for the aroma and secondary flavours of the rum. The fermentation process takes about 120 hours in closed stainless steel containers which ensures that the CO2 (Carbon Dioxide) can be caught. After filtering and liquefying it can be sold to the soda industry (like Coca Cola). The fermentation is done slowly to give the yeast the time it deserves. During the fermentation process various factors such as temperature, pH and other biochemical variables are strictly controlled. The fermented must is also known as ‘wine’ and has a low alcohol content containing by-products that are not fermentable. Just like the harvest and the fermentation, the distillation is done in the lowlands. According to Lorena, distillation is the part that gives or defines the character of the rum. If this is not done correctly, it is very difficult for the Master Blender to adjust this in the blending part of the production. You need a good basis to build on. Zacapa rum is distilled in columns, which contain copper fittings, in a continuous distillation process. The produced ‘wine’ or fermented must is heated using steam until it reaches a point in which the alcohol is evaporated. This alcoholic vapour passes through some condensers where it is liquefied again. In the first stage of distillation the alcohol is separated from the fermented must, and the yeast and other non-fermentable products are removed. To get the best result for every type of Rum that they produce at Zacapa, the differences of the Rum starts in the distillation process. Each of the rums (Zacapa 15, Zacapa 23 and Zacapa XO) will start with a different fresh spirit. The distiller already knows which rum will be the outcome before he starts the process. The higher the exit, the cleaner the product and higher the alcohol. Alas this also means the taste or flavour is less. All this results in a different kind of balance between the aldehydes, esters and superior alcohol. Since they tap from several exits, they can blend these different types into a new type. By changing the recipe of each blend you get the 3 different basic alcohols (fresh spirit) that are used for the 3 earlier mentioned rums. The alcohol percentage of the fresh spirit for the Zacapa 15 and Zacapa 23 is between 88 and 92% alcohol. The blend for Zacapa 15 is simpler, because the alcohol is closer to 92%. The blend for the Zacapa 23 has an alcohol percentage closer to 88%. Therefore it has more flavour and the taste will show more fruitiness. The blend for Zacapa 15 is cleaner and with less flavour in it. The distillation process also yields a by-product called “vinasse.” This liquid contains sugars, mineral salts (especially potassium), nitrogen and sulphates. The vinasse is utilized to irrigate the sugar cane fields and it is pumped from the distillery to where it is needed into a five miles pipeline which ends up at the sugarcane fields. In the system the methane gas is collected and used to fire up the steam engine. This way they can create their own power and when there is enough they can also sell it to the local people.